This is simply a personal favorite song of mine. 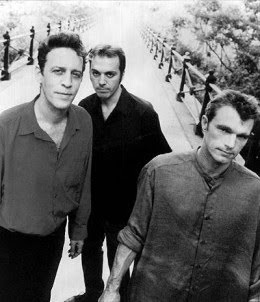 Believe it or not, it has been over 11 years since Mark Sandman - the lead singer of Morphine - passed away. The music that these guys wrote was sometimes haunting, as the song posted today will be a testament to. Rarely was there a true guitar used in their music, as many of their songs simply featured a 2-string bass guitar played with a slide, various percussion instruments, and a drummer. You would occasionally hear a piano or traditional guitar used, but that was rare. When I think of Morphine, I think of this song, "Hanging On A Curtain". Many may remember their track "Honey White",off of Yes, but it's many of the other songs that made an impact on how I feel about this band. This song sums them up perfectly, for me. The sad part is that back in July of 1999, these guys were supposed to play at the House of Blues in Las Vegas, opening for now defunct band Soul Coughing. I heard about Sandman passing away while on stage at a festival in Italy. Believe it or not, I somehow found M Doughty's e-mail address, and sent a quick message. The two bands worked together at shows fairly often, and from what I understand, Doughty and Sandman were pretty good friends. I actually received a response back, and man do I wish I had kept that! Anyhow, I hope you guys enjoy this one, this week.